In the far northern reaches of the planet, climate change is transforming the frozen Arctic landscape. Rising temperatures have accelerated glacial melt and the loss of sea ice at an unprecedented rate, straining the fragile ecosystem. The potential economic opportunities associated with an ice-free Arctic, such as new shipping lanes and untapped energy resources, have driven nations to assert territorial claims and establish sovereignty in the region. As a result, uninhabited Arctic areas like Hans Island are becoming focal points for diplomatic contention. The dispute over the island has created tension in Canadian - Danish relations and raised questions regarding Arctic sovereignty. Although the disagreement has not resulted in violence, the Hans Island conflict reflects the growing international interest in the Arctic as a result of climate change. Hans Island is the smallest island in Kennedy Channel of the Nares Strait, the body of water that divides Greenland and Canada's Ellesmere Island. Situated in the center of the channel, the barren island measures 0.5 square miles and has no known natural resources. Despite occasional visits by Danish and Canadian representatives and scientists, it remains uninhabited. "The vessel was tied to a large floe, and drifted slowly down the channel with the pack ; about noon, she was quite near Hans Island and west of it...the ship continued to drift, and at 7 p. m., was midway between Hans and Franklin Islands, which are ten miles distant from each other. Soundings were taken at a depth of 203 fathoms, with a bottom of black limestone." Hans Island, a Disputed Island in the Nares Strait Near Greenland. NASA LandSat 7 Image from NASA World Wind uploaded by Finlay McWaltern, July 29, 2005. Source: Wikimedia Commons. Conflict over the island began during the 1973 maritime border treaty negotiations between Canada and Denmark. On December 17, 1973, the discussions culminated in a delimitation treaty about the continental shelf that established a border between the two countries (Stevenson 2007). The agreement, which was the longest shelf boundary treaty ever negotiated at the time, identified 127 points of latitude and longitude between the Davis Strait and the end of the Robeson Channel. The geographic coordinates between point 122 (80 49' 2 - 66 29' 0) and point 123 (80 49' 8 - 66 26' 3) remained unmarked due to disagreements over the ownership of Hans Island (Stevenson 2007). The dispute over the island remains unresolved to this day. Agreement between the Government of the Kingdom of Denmark and the Government of Canada relating to the Delimitation of the Continental Shelf between Greenland and Canada. By Lasse Jensen, July 29, 2005. Source: Wikimedia Commons. Hans Island is located roughly 600 miles south of the Arctic Circle, situated in the Kennedy Channel of the Nares Strait. The strait divides northern Greenland and Canada’s Ellesmere Island, and joins the Lincoln Sea with the Baffin Bay. As melting sea ice opens up new sea passages in the Arctic Ocean, Hans Island may encounter increasing amounts of maritime traffic. In the map below, it is the smallest and northernmost of the three islands in the channel. 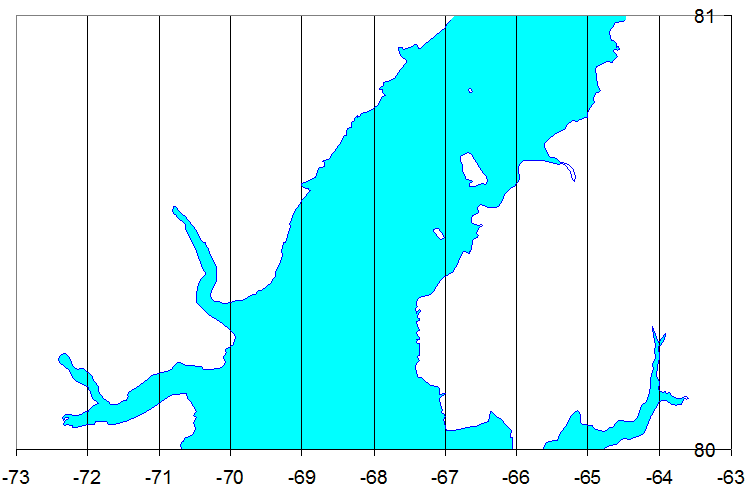 Map of the Kennedy Channel in the Nares Strait, prepared from Digital Chart of the World (DCW) data. 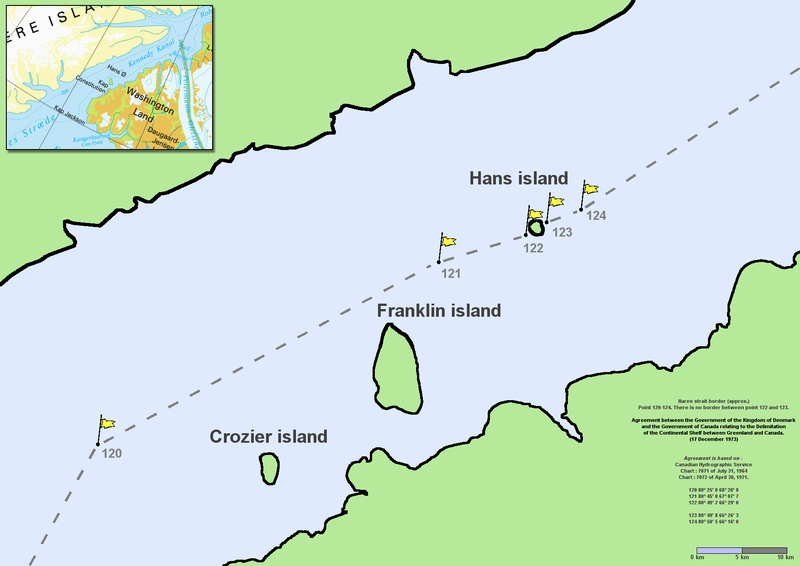 From north to south, the islands in the center of the channel are: Hans Island, Franklin, and Crozier. Source: Wikimedia Commons. Canada claims ownership of Hans Island through the British Adjacent Territories Order, which transferred British Arctic possessions to Canada on September 1, 1880 (Stevenson 2007). In the early nineteen eighties, the Canadian company Dome Petroleum conducted research on the island. Denmark claims ownership through Greenland, which is considered to be an autonomous country within the Kingdom of Denmark. In 1933, the Permanent Court of International Justice ruled that Greenland was under Denmark's legal jurisdiction (Den. V. Nor. 1933). Climate change is rapidly changing the Arctic landscape. In December 2011, an international team of scientists found that warmer temperatures have significantly altered the terrestrial and marine ecosystems in the region. "We have a new normal," Don Perovich, a sea ice expert at the U.S. Army Corps of Engineers' Cold Regions Research & Engineering Laboratory, told Reuters news agency (Zabarenko 2011). "...that has implications not just for the ice but other components of the Arctic system." Some of the environmental consequences of a warmer Arctic include the reduction of sea ice and glaciers, increased vegetation in the tundra, more acidic seas, and other effects. Reduced ice will result in a lower albedo and accelerate the rise of temperatures in the region. The report found that the baseline Arctic air temperatures were 2.5 degrees Fahrenheit higher in 2011 than they had been in the past thirty years (Zabarenko 2011). Reduced sea ice will negatively impact the habitats of polar bears and walruses, two crucial animals in the Arctic food chain. 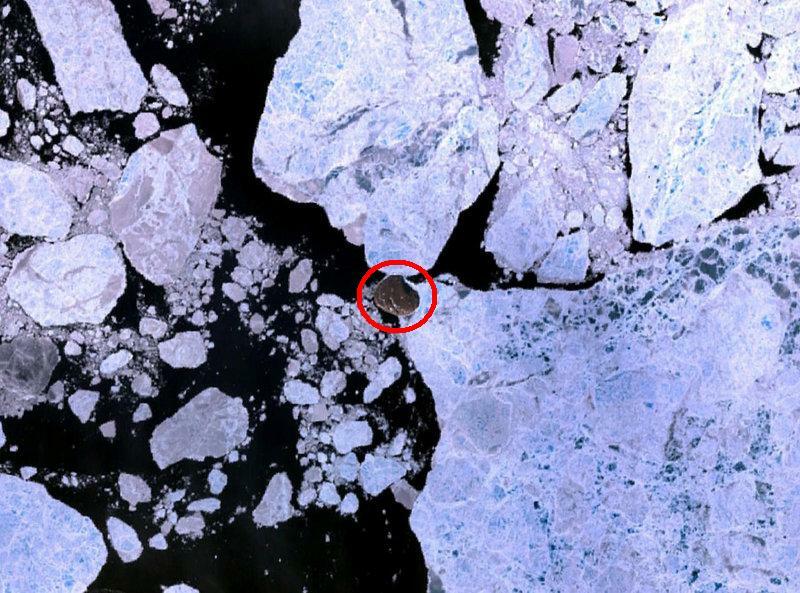 Ice floes are used as hunting platforms for both animals. Conversely, whales will benefit from the warmer temperatures. Less light will reach the ocean's upper layer as a result of reduced sea ice and spur the growth of plankton, a key food source for many marine creatures. An ice-free Northwest Passage will also unite bowhead whale populations from the Pacific and the Atlantic. 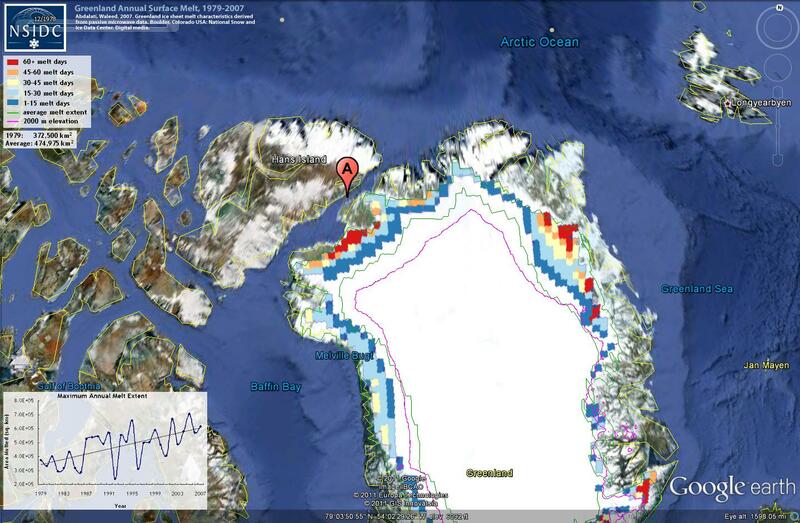 The Greenland Ice Sheet is also experiencing record levels of ice sheet mass loss. A 2011 NOAA study found that the total ice sheet mass loss was 70% larger than the average annual loss rate of -250 Gt y-1 and recorded it as the third highest loss of mass since 1979 (Richter-Menge et al. 2011). Greenland Ice Sheet Melt Characteristics Derived from Passive Microwave Data, 1979 - 2007. Abdalati, Waleed. 2007. Boulder, Colorado USA. Source: National Snow and Ice Data Center. The harsh climate of Hans Island has deterred humans and animals alike from permanently settling the island. Given its proximity to the North Pole, Hans Island is best classified as a polar habitat. Although Hans Island itself is not experiencing any adverse effects as a result of climate change, rising temperatures are significantly impacting terrestrial and marine ecosystems in the Arctic. The conflict over the island is bilateral. Although the controversy surrounding Hans Island has raised diplomatic tensions between Denmark and Canada, the level of conflict remains low. Dubbed "one of the world's friendliest border disputes" by National Public Radio (Reynolds 2005), numerous websites and articles have poked fun at the mild nature of the conflict. The dispute first came to the attention of the press in 1984, when historian Kenn Harper published an article about Hans Island in the small local newspaper. The story was reprinted in a Danish newspaper and picked up by CBC Radio in Canada, but the issue did not receive international attention until late March 2004, when the Canadian National Post published an article on the government’s intention to assert its sovereignty in the Arctic. Several days later, the National Post published a second article entitled, "Danes summon envoy over Arctic fight -- the solution of the dispute is not going to be military." The story alleged that Brian Herman, a Canadian diplomat stationed in Denmark, had been asked to comment on the Hans Island dispute before the Danish Ministry of Foreign Affairs. Both governments denied that the request had been made to Herman or any other Canadian official. The conflict over Hans Island has also been characterized by an exchange of flags and alcohol. In 1984, Canadian troops visited the island, planted the Canadian national flag, and left behind a bottle of whiskey. One week later, a Danish government official replaced it with a Danish flag and buried a bottle of Danish brandy at the bottom of the flag pole, and reportedly leaving a note that welcomed visitors to Denmark. In 2005, the Canadian Defense Minister Bill Graham erected a Canadian flag, which sparked a letter of protest from the Danish government. Interest in the island also generated a “Google war” on the Internet. In 2005, a Canadian man by the name of Rick Broadhead purchased an advertisement on Google after he saw a Danish ad on the search engine that read, "Does Hans sound Canadian? Danish name, Danish island" (Reuters 2005). The ad linked to the Danish Foreign Ministry's website. Broadhead retaliated by posting a Google ad stating: "Hans Island is Canadian" (Reuters 2005). No fatalities have emerged from the disagreement over Hans Island. However, given the strategic importance of the Arctic and the economic interests surrounding it, military presence in the region may increase in the future. 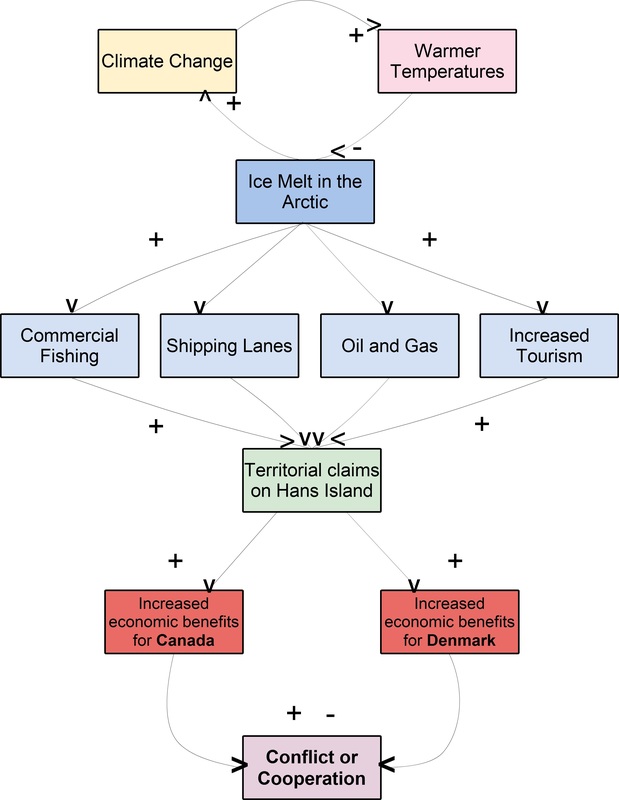 Because climate change in the Arctic will create numerous economic opportunities for Canada and Denmark, settling the dispute over Hans Island is of moderate strategic interest. Diminishing sea ice will increase access to shipping lanes, fisheries, and oil and natural gas reserves, and warmer conditions may extend the tourist season. generate tourism. Although Hans Island does not possess any natural resources, its location in the Nares Strait may make place it near the path of future shipping routes. The outcome of the dispute may also influence future Arctic sovereignty disagreements down the road. The status of the Northwest Passage, the sea route along the Arctic Ocean, is a central debate in Arctic sovereignty issues. Canada considers the route to be exclusively part of Canadian territory, but Denmark views the Northwest Passage as international waters. Reduced sea ice will increase shipping traffic, as well as tourist activity, in the area. One study found that if the projected seasonally ice-free Arctic occurs within the next decade, "tremendous shipping benefits would accrue as transitioning the Northern Sea Route above Russia between the North Atlantic and the North Pacific would trim about 5000 nautical miles and a week's sailing time compared with the use of the Suez Canal and through the Malacca Straits" (Ho 2010). Reduced sea ice may also open up access to oil and natural gas reserves in the Arctic. A 2008 United States Geological Survey estimated that the Arctic seabed holds 13 percent of the planet’s untapped oil reserves, or 90 billion barrels of undiscovered oil (United States Geological Survey 2008). Utilizing these resources would decrease reliance on imported oil, although many scientists are concerned about the potential effects of the oil industry on the Arctic ecosystem. Given that Canada and Denmark are members of the North Atlantic Treaty Organization (NATO), as well as several other Arctic countries, the organization may play a role in future Arctic affairs. In NATO and the Arctic: is the Atlantic alliance a cold war relic in a peaceful region now faced with non-military challenge? Helga Haftendorn argues that it is imperative for NATO to be prepared for the implications of climate change on the defense capabilities of its members. “With a greater accessibility of the Arctic SLOCs [sea lanes of communication] and mineral resources, attention to the Arctic will grow and potentially might become a source of conflicts in the Polar region,” Haftendorn asserts (Haftendorn 2011). The Danish-Canadian dispute over Hans Island remains unresolved. But although melting glaciers and reduced ice may cause conflict, there are also opportunities for international coordination between Arctic countries. The Arctic Council is one example of collaboration between Denmark, Canada and other Arctic nations. Established under the Ottawa Declaration of 1996, the intergovernmental panel facilitates coordination on range of Arctic foreign policy issues, including sustainable development, indigenous rights, and conservation. In 2011, the council successfully oversaw negotiations for the Arctic Search and Rescue Agreement, an international treaty created for the purpose of coordinating search and rescue coverage and response. The agreement reflected the growing importance of the Arctic as a result of climate change and demonstrated that there are opportunities for collaboration in the region. The conclusion of the disagreement over Hans Island may profoundly influence future conflicts regarding Arctic sovereignty disagreements. Cooperation and comprehensive international frameworks are essential to avoiding conflict over resources in this region and finding an encompassing solution to the problem of climate change in the Arctic. The following cases provide more information about climate change conflicts in the Arctic. Hall, Charles Francis. "Full Text of "Narrative of the North Polar Expedition U.S. Ship Polaris, Captain Charles Francis Hall Commanding"" Internet Archive: Digital Library of Free Books, Movies, Music & Wayback Machine. The Internet Archive. Web. 19 Dec. 2011. <http://www.archive.org/stream/narrnorthpolar00davirich/narrnorthpolar00davirich_djvu.txt>. Stevenson, Christopher. "Hans Off! The Struggle for Hans Island and the Potential Ramifications for International Border Dispute Resolution." Boston College International and Comparative Law Review 30.1 (2007). Web. Zabarenko, Deborah. "Whales Win, Walruses Lose in Warmer Arctic." Reuters. 2 Dec. 2011. Web. 19 Dec. 2011. <http://www.reuters.com/article/2011/12/02/uk-climate-arctic-idUSLNE7B100H20111202>. Reynolds, Richard. Who Owns Hans Island? 12 Aug. 2005. NPR News. National Public Radio. Web. Transcript. "Island Squabble Goes Google." CNN.com. Reuters, 28 July 2005. Web. 19 Dec. 2011. <http://web.archive.org/web/20050731024234/http://edition.cnn.com/2005/WORLD/americas/07/28/canada.denmark.reut/>. United States Geological Survey. 90 Billion Barrels of Oil and 1,670 Trillion Cubic Feet of Natural Gas Assessed in the Arctic. 23 July 2008. Web. Ho, Joshua. "The Implications of Arctic Sea Ice Decline on Shipping." Marine Policy 34.3 (2010): 713 - 15. Print. Haftendorn, Helga. "NATO and the Arctic: Is the Atlantic Alliance a Cold War Relic in a Peaceful Region Now Faced with Non-military Challenges?" European Security 20.3 (2011): 337-61. Print.